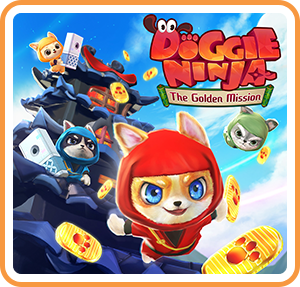 "Doggie Ninja The Golden Mission" is a PvP action game up to 4 players can play. Let's enjoy this game with anyone, anytime, and anywhere! Break the castle!! Crush the rivals! Let's throw the wall blocks to break the castle! But watch out! If you break all the blocks holding the roof, the roof will fall down! Once the falling roof hits a Doggie Ninja, He/she will be blown away! The player collecting the most coins wins! Once you break the golden blocks, you can get coins. Let's break the golden blocks to collect lots of coins! There're 3 unique castles you can play! There are iron blocks that break through the floor and bomb blocks that destroy nearby blocks! You can enjoy different games for each stage!